set both rivets and eyelets? The answer depends on whether you want to rivet mostly leather, or mostly metal. For leather, see my Riveting with TierraCast Leather Findings tutorial. This list of riveting tools allows you to pierce 1/16″ and 3/32″ holes without having to trade piercing bases all the time, and easily set 1/16″ and 3/32″ rivets and eyelets on flat and sharply curved items. If you plan on riveting only flat items, then skip the domed piercing bases and reverse riveting tools. A swivel vise is handy for holding the riveting tool at the angle of your choice, freeing your hands for slippery stacks of items to be riveted. Colorful metal storage tins for holding tiny rivets and eyelets — My favorite is the set of 20. What sizes of rivets and eyelets are best to start with? Definitely the assortments — one of each size — because then no matter what new project you start, you’ll have the right length. The color choices are copper, brass, and aluminum. If it’s a toss-up for you, I recommend copper. It’s the easiest to polish or antique, and is a nice accent for any color of metal. Or brass, because all the eyelets are brass. Oh, and the #1 riveting question is: What’s the difference between all these types of rivets and eyelets? I hope this helps you pick the ideal riveting tools for the projects you have in mind! Feel free to post questions below! Available in over 100 lengths, diameters and materials! Classic “old-school” wire rivets are simply wire — they can be made from any gauge of malleable wire, in any length you need. This is a wonderful skill, but time-consuming to do properly. Nail-head rivets and fancy wire rivets are half as much work as wire rivets, because one end is already finished for you. A little tough to set (hammer and block), but worth the effort! Eyelets are tubes with flared ends. One end of a rivet sometimes looks like an eyelet. The main difference between a rivet and an eyelet, is that you can see all the way through an eyelet after you set it, but at least one end of a rivet is always solid. If the eyelet is large enough, you can also run wire, chain or a jump ring through the resulting reinforced hole. 3/16″ diameter, and fits up to roughly 3/16″ (almost 5mm) thick leather or stacked materials. Make your own eyelets from tubing — any length! 3/32″ tubing (copper, brass or sterling) is cut to length with a jeweler’s saw, and must be riveted by hand. Crafted Findings’ sterling silver tubing (1.5mm and 2.25mm diameter) up to 12mm long can be set with the Crafted Findings riveting system, but must be cut to length with a jeweler’s saw. This brief overview explains how to set each type of rivet and eyelet, with links to detailed step-by-step riveting tutorials … a few of which aren’t written yet, but will be by the end of May (notice I didn’t specify May of which year…). If you have questions about any of these short & sweet instructions, post your questions in a comment on this blog. Get a metal block, rivet setter and brass hammer. See our “Riveting with TierraCast” blog article for full directions (and fun supplies). Semi-tubular rivets and accessories, Crafted Findings riveting tool and Tschinkel’s Circles riveted leather bracelet (see Tutorial). Choose 1/16″ or 3/32″ diameter rivets and accessories. Choose an Original or Long Reach base. The Original tools set rivets up to 9/32″ (a bit over 1/4″); the Long Reach tools set rivets up to 15/32″ long (almost 1/2″). For help choosing options, download our Crafted Findings Technique sheet — 4 pages of tips, comparisons and explanations for each tool and accessory. Use one end of the Crafted Findings riveting system tool to pierce a hole. In the video and examples here, notice how tiny the back end of the rivet is, on the finished semi-tubular rivets. fyi ~ You can click most of the jewelry images to enlarge. It is a very clean look, and holds tightly when you are riveting metal to metal (or any non-stretchy media). You can quickly convert almost any thin brass, copper, sterling, plastic/vinyl or cast metal spacer bead into a washer/stopper, by using the cutting end of the Crafted Findings tool to cut the hole to the proper size needed for their rivets. You can make classic “old-school” wire rivets from any gauge of wire (generally copper, brass, nickel, sterling or karat gold), in any length you need. This is a wonderful skill, but time-consuming to do properly. Fit wire through the components. Depending on the wire gauge, about .5 to 1mm of wire should stick out at each end. See more detailed version here. Take a class. If you can’t find a local class, then see if you can wrangle a trip to one of the BeadFests (Santa Fe is my favorite, but Philadelphia is fun too), or the Bead&Button show. Drill or punch holes the correct size for your rivet’s post. Fit rivet through the components, and mark where to cut. Depending on the wire gauge, about .5 to 1mm of wire should stick out at the back. Cut to the proper length, and file flat. Set item on a steel bench block, rivet-head down. Use a riveting hammer to tap a few times on the top of the wire, to start mushrooming the wire. Hammer gently around the edges of the wire, until it is smooshed down into a nice smooth dome. See the “How to Use Fancy Wire Rivets” blog tutorial for detailed instructions (except you don’t need the wooden block or piece of leather). See the full tutorial in our April 5th, 2013 blog: How to Use Fancy Wire Rivets. As promised above, you can use the “hammer and block” technique for Crafted Findings semi-tubular rivets. Assortment packs (1/16″ or 3/32″ diameter) offer a nice variety of lengths. Cut or drill 1/16″ or 3/32″ holes using the tool of your choice, such as the EURO TOOL “helicopter” metal punch, EURO TOOL 3-hole punch (1/16″, 3/32″ and 1/8″ holes), drill press, or the cutting end of the Crafted Findings piercing/setting tools. Important: The hole must be precisely 1/16″ or 3/32″ (depending on which size of rivets you selected). If the hole is too large, everything will fall apart. Stack components on the rivet and make sure you have 1-2mm sticking out the back. Place the stack rivet-head down on a metal bench block. Hammer with a riveting hammer or a light-weight ball-pein hammer. Hammer gently so you get a nice round shape. If you’ve formed traditional wire rivets before, you’ll be surprised at how fast this goes when setting a semi-tubular rivet! Run your finger across the rivet; if it is rough, keep hammering until it is smooth. Pshew … I think that’s all the types of rivets. You don’t really want to know how to set Eyelets too, do you? Just kidding, I have a fresh hot cup of tea, so here we go! The main difference between setting eyelets and setting rivets, is you need to make sure the eye stays round and open, so eyelet setters have slightly different shaped tools than rivet setters. Punch 3/16″ hole in leather. 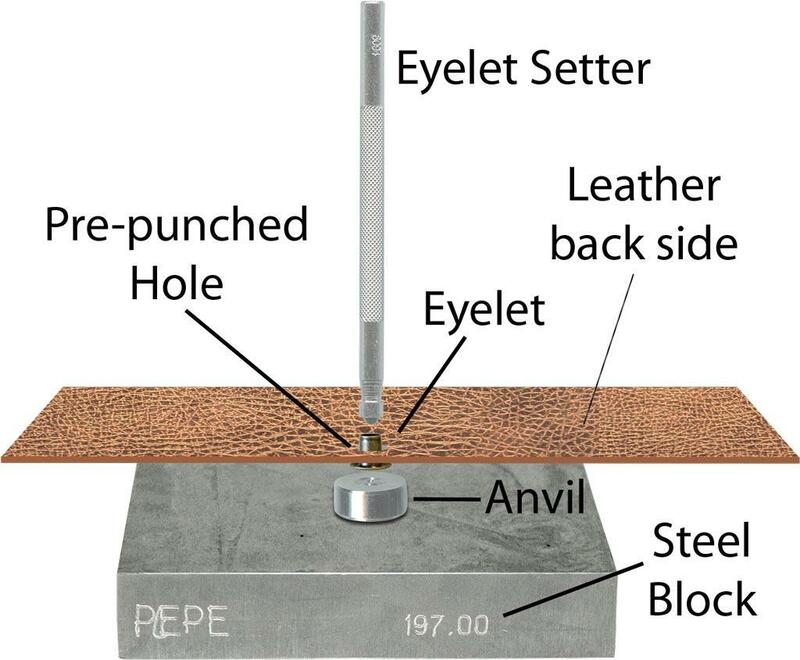 Set anvil portion of eyelet setter on a sturdy surface (wooden block, Poundo board, heavy leather, etc. )… preferably something quieter than the steel block pictured below. Assemble components and place large end of eyelet on anvil. Place eyelet setter into eyelet and tap eyelet setter firmly with a brass hammer until the eyelet curls/compresses down to desired height. Choose a size. The 1/16″ eyelets have a petite hole — very cute, but not many things fit through it. I recommend 3/32″ eyelets if you want to put jump rings, chain or cord through the eyelet when done. Switch out Crafted Findings tool accessories if necessary (the default tool comes with a riveting attachment, which you switch out using the included allen wrench for an eyelet flaring attachment). This is a little trickier, and deserves its own blog article, so I’ll be brief for now and expand on this in a future article. Make sure the end of your tubing is smooth and flat – not angled. File flat if necessary (before cutting). Take components off tube, and hold tubing in tube-cutting jig. Use a jeweler’s saw to cut the tubing, making sure to keep the cut very straight and flat, not angled. File end of tubing flat if necessary. Insert tubing through components. Set item on steel bench block, and keep the components centered on the tubing. Put a very wide center punch (at least ¼” wide) into the center of the tube. Don’t let your components slide down to the bottom of the tube! Give 3 taps with a brass hammer. Turn piece over and repeat. This begins to gently splay the tube rivet outwards. If you were too gentle at first, then repeat this step on both sides. You should see a slight curve outwards. Watch for a future blog for more details, or download our Riveting Technique Sheet. Cut the tubing to length using a jeweler’s saw like above. Use a 1/16″ eyelet flaring attachment for the 1.5mm sterling tubing, or use a 3/32″ eyelet flaring attachment for 2.5mm sterling tubing. Be sure to use this tubing, because if the walls are too thick, it won’t work with their nifty system. If using tubing over 1/4″ long (and up to 15/32″ aka 12mm), use the long reach tool. Otherwise, you can use the standard tool. That’s a LOT of variations, but each serves a special need. I use the Crafted Findings system the most, because I can do 20 rivets (or more) in the time I can do one nice wire rivet by hand. Or I can do 30 eyelets in the time it takes me to make one nice 3/32″ tube eyelet by hand. I also like their reverse riveting accessory, because it allows me to rivet rings and bracelets, keeping the nice rivet head on the outside (try doing THAT by hand…!). I promise I’ll explain that cryptic comment more thoroughly, with good illustrations, in another blog post. But at the same time that I love the speed and precision of the Crafted Findings system, I also love the look of a nice hand-tooled rivets and eyelets, and the soothing tap-tap-tap that reminds me of Santa’s elves. “Cognitive Resonance” is my favorite piece that I’ve made. For bigger bolder designs in leather, you will probably go with the TierraCast or other 2-part rivets, perhaps in conjunction with the 3/16″ eyelets. Plus, I really like the idea of upcycling old bits of leather and making custom-length leather bracelets with TierraCasts’s full Leather Findings Collection of rivetable clasps, strap tips and links. I’m sure I glossed over a few things in this lengthy article, so feel free to post questions!